Smoked Scottish salmon (Salmo salar) slices with lemon and mixed peppercorns, defrosted. 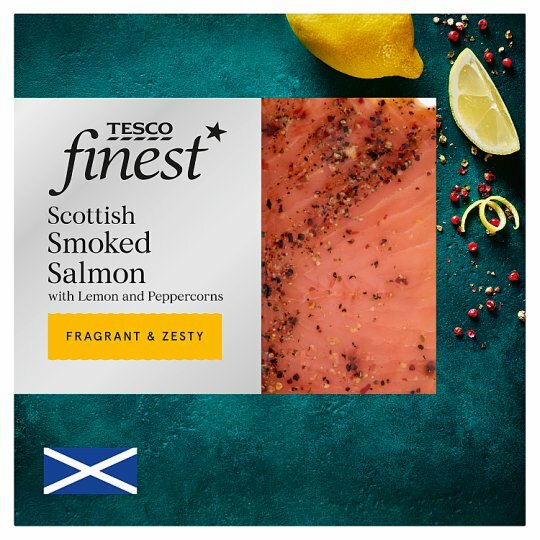 INGREDIENTS: Smoked Salmon (97%) [Salmon (Fish), Salt, Sugar], Lemon Zest, Cracked Black Peppercorns, Cracked Green Peppercorns, Red Pepper, Lemon Oil, Whole Pink Peppercorns. Keep refrigerated., Once opened, keep refrigerated and consume within 2 days and by ‘use by’ date shown. This product may have been previously frozen and has been restored to chill temperatures under carefully controlled conditions. Defrosted: It is suitable for home freezing. This smoked salmon is ready to eat. To enjoy this product at its best, remove from fridge 10 minutes before serving. Defrost thoroughly for a minimum of 8 hours in the fridge. Once defrosted use on the same day and do not refreeze.